For instance, export of Brazilian rosewood was banned by the CITES treaty in 1992 due to overharvesting of this lovely wood (lumber from rosewood trees which fell naturally is still permitted). And bamboo -- technically a grass rather than a true wood – was the darling of the green set around the turn of this century. However, it's since come under question amid reported problems like non-sustainable harvesting, creation of monocultural bamboo plantings which threaten local biodiversity, and use of potentially harmful fertilizers and pesticides. The Forest Stewardship Council, an international non-profit organization in operation since 1993, “helps take care of forests and the people and wildlife who call them home.” Only wood (and paper) that meets the Council’s high standards is FSC certified. Bamboo is considered a wood for this purpose. FSC 100%, virgin wood grown in forests certified by the Council as sustainably managed with responsible harvesting practices. FSC Recycled, wood produced from recycled material, usually pre-consumer. 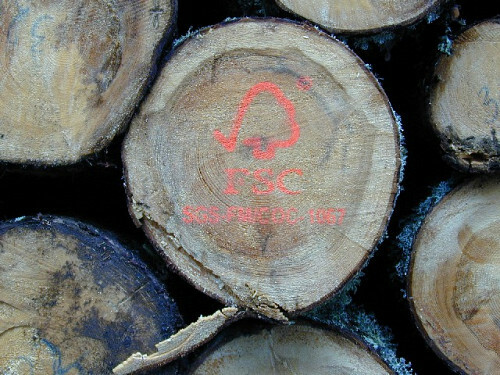 FSC Mixed, a product comprising a minimum of 70% FSC-certified or recycled wood, while the remainder is “controlled wood,” from sources the Council deems acceptable. If you are shopping at brick-and-mortar home stores or suppliers, you’ll see that all FSC certified wood and paper products are clearly marked with the Council’s logo – a checkmark combined with the silhouette of a tree. To find FSC certified products and suppliers online, you can use the search tools on the Forest Stewardship Council site. And when you hire a contractor, make sure that they will use certified wood for your home construction, remodeling, or repair project. Forest Stewardship Council certification falls into the responsible extraction category of LEED’s “Building product disclosure and optimization – sourcing of raw materials” (MRc3). Using at least 25% responsibly extracted products, by dollar value, will make a new construction project eligible for an LEED credit. Sustainable Forest Initiative (SFI). Launched by the American Forest and Paper Association in 1994, the SFI is the largest certifier in North America, the only area where it currently operates. Programme for the Endorsement of Forest Certification (PEFC). The PEFC is a non-profit NGO founded in 1999, which monitors forests internationally. Although less known than the FSC to the average homeowner, the PEFC has grown to become the largest certifier of sustainable, responsibly managed forests worldwide. Use of reclaimed or salvaged lumber. An out-of-the-box alternative avoids the use of newly harvested timber altogether. Two possibilities are utilizing reclaimed wood from barns and other structures that are being demolished and sinker wood salvaged via underwater logging.